In order to reduce the enormous quantity of resulting graphic data, which depends on selected resolution and Paper Format, the file has to undergo a compression algorithm. This algorithm scans the image data for indirect or direct recurrences of the same byte value sequences, and then stores where and how often it found certain sequences of byte values, instead of wasting memory space with the detailed repetition of the same sequences. · LZW – named after its creators Lemple, Zif and Welch – is a very powerful, loss-free compression algorithm, which achieves outstanding compression rates for all kinds of image files. The patent for the LZW algorithm is held by the Unisys Company; the patent protection expired in the USA on 20th of June 2003, but it remains, however, valid until 18th of June 2004 in Germany, England, France and Italy. For reasons of patent law, we are allowed to offer you the upgrade including "LZW" option only after 19th of June 2004. The upgrade will take place automatically requiring no intervention from your or our side. 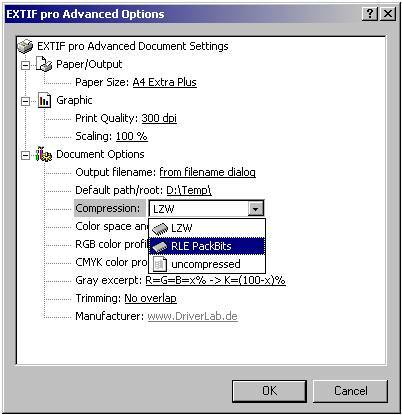 · RLE PackBits (“Run Length Encoding“) is designed for gray scale images and therefore is most suitable for setting “Separate file for each CMYK channel” of property “color space and file ”.